Located in the SW quadrant of Calgary, Christie Park is a community between downtown Calgary and the Rocky Mountains. With all the important amenities nearby, Christie Park real estate is a popular choice for families of all ages and sizes. Here are all the current homes for sale in Christie Park, and read more about this neighbourhood below. 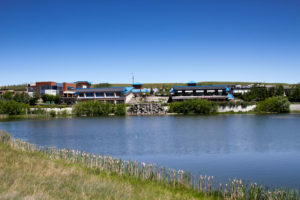 Christie Park is located along 17 Avenue South, in between Sarcee Trail and 69 Street West. It is similar to other communities nearby, including Aspen Woods, Signal Hill and Strathcona Park. Christie Park real estate is mostly detached homes, with also a few condos. Calgary Transit serves the community with buses and trains. There are two LRT stations nearby – Sirocco and 69 Street stations. Trains go through downtown and up to the northeast. Transfers can be quickly made downtown, and trains travel down to the south or up to the northwest. Buses regularly run nearby Christie Park and lead to nearby shopping and the LRT stations. Aspen Landing is a large shopping centre located nearby Christie Park. It has shops, restaurants and services along a beautiful lake. A variety of nearby shopping centres have major retailers, restaurants, boutiques and all the important services. Westhills, Signal Hill Centre and Aspen Woods Landing are all minutes away. There is a public library in Signal Hill Centre. Westside Rec Centre is close also. There are a variety of schools at all levels nearby, including Olympic Heights Elementary School, Ernest Manning High School and Ambrose College. Along with Strathcona Park and Aspen Woods, Christie Park is part of the Strathcona Christie Apsen Community Association. Christie Park and surrounding communities are popular choices for Calgarians seeking easy access to both the mountains and downtown. With all the important amenities nearby, staying close to the community is just as desirable. Contact us today to learn more about homes for sale in Christie Park.